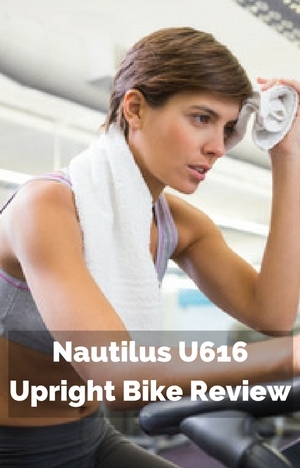 Nautilus U616 Upright Bike is the upgraded upright exercise bike. It has some enhanced benefits over their U614 model. It looks like the same smart looking upright exercise bike. But it has more resistance levels (25), more pre-set programs (29 in total), bluetooth, 3 piece crank and more. It does come at a higher price to cover these. It comes well rated by customers but there are a couple of things to consider about the bike. In my review I look at these and how all these features and others add up for a low impact cardio workout to help you achieve your fitness goals whether you are just getting started to those looking for more serious levels of exercise and training. And as part of that I talk about the price difference and what you get for that to give an idea of the value for money. To start , I look at how it keeps you steady while you get your workout. Its’ steel frame and stabilizer bars that hold you steady at all intensity and there is no feeling of you being tipped as you workout. It doesn’t creak or groan so there is no distractions. There are 2 levelers on the rear stabilizer that should balance up the bike and prevent any rocking when there are small variations in the floor. It will keep the bike steady on all floor types. The bike comes with a reasonable warranty with 10 years on the frame, 2 years on parts, 1 years on electronics and 90 days on labor. People say the bike feels well constructed and there is only one review that says the bike hasn’t lasted – unfortunately I’ve not found any feedback from other customers as to how the bike is lasting – good or bad. I assume from the fact there is only one that the majority are getting good use from the bike and that it is trouble free. The bike seat can be adjusted vertically and horizontally to get the most comfortable fit. As well as getting the right positioning for your legs it can help to get a more comfortable fit in relation to the handlebars. From customer experience the bike can be used by people from 5 ft to 6 ft 2 ins for a comfortable fit. (Supplier doesn’t provide this information). If you are over the height you can use the bike and depending on leg length you may get proper leg extension as well as feel comfortable otherwise you are likely not to get the leg extension which can lead to pain and injury when used for extended periods. Below this height you are likely to find that you will have to stretch to reach the pedals at their furthest point from the seat. The height and vertical position of the handlebars can’t be changed but you can change the angle which can help with sizing the bike for people’s different heights and preferences. Making the adjustments is quick and easy to do. If there is more than one of you using the bike it won’t delay your workout by more than a few seconds – it’s not enough to give you second thoughts about getting on the bike. You do need to make the adjustments for the seat before you get on the bike. You loosen the adjustment knob and slide the seat to wear you want for the horizontal position and tighten up. The 25 levels of magnetic resistance are quiet and smooth. The increases are incremental without any jerkiness. They go from easy to very hard. You change the level by using the up/down buttons or the quick jump buttons on the console. There are 10 quick jump buttons and they allow you to set the resistance at one of these 10 levels without having to press the up/down buttons to get there. The 10 levels you can jump to are 1, 3, 5, 7, 9, 12, 15, 18, 21 and 25. When you are using one of the pre-set programs the resistance is adjusted automatically but you can override that if it isn’t at a level you want by pushing the resistance buttons. The lowest level of resistance is very easy so can suit anyone who is just getting started – it is almost like there is no resistance. It goes up in small increments. The transitions are smooth even when using the quick jump buttons – there’s no sudden increases or decreasing in resistance. It goes up to very hard which should suit all but the toughest athletes /or when standing on the pedals (which Nautilus asvise against doing as they aren’t tested for this) where with the added leverage it may feel soft if you are an experienced cyclist. The bike has a belt drive and perimeter weighted flywheel. This operates very quietly and is low maintenance – there is no lubricating or adjusting the tension that you get with a chain drive. It provides a smooth pedaling experience with the weight of the wheel helping to pull the pedals through to prevent choppiness in the motion. Although at the top end of the resistance you may notice some pulsing as the resistance starts to work as a brake slowing them down – it does add a little impact and makes it a little tougher to have the best pedaling form. It just needs a little more focus to keep a 360 degree stroke. All these moving parts are enclosed in the shroud which keeps them from being damaged by sweat and dirt. It also stops children and pets and others from being hurt by all those moving parts. The oversized pedals come plastic straps to provide a good solid platform and prevent your feet from slipping off. The pedals are designed to be used with athletic shoes. The strap can be a little awkward to adjust at first when the plastic is a little hard – it uses a hole that is put over a tab on the pedal to hold in place. Once you’ve adjusted the first time it is possible to slide your foot in without adjusting. You can take the strap off if you don’t want to use it. The pedals are attached to a 3 piece crank which is durable and strong for pedaling against all levels of resistance in the seat. Although possible to stand on the pedals, it is not made for this as advised by Nautilus (when I contacted them) and you may find it is awkward as you don’t have the room to move like you do a spin bike. You may find the resistance is not what you need for standing and that your pedaling motion may become more up and down as the weight of the wheel doesn’t pull the pedals through. You may also find it reduces the life of the bike. You can pedals backwards but there isn’t any resistance to push against. Seat. The seat is oversized and padded which helps with comfort and balance for users. And many do like the way the seat feels getting a comfortable and pain free experience. Like all bike seats not everyone is going to be that fortunate. They’ll find it tough on the sit bones which can result in not finishing their workouts. It is very much down to personal preference. If you are new to using an upright exercise bike and/or haven’t been on a bike for awhile you are likely to find it tough until you’ve broken in the saddle anyway – it does take time to get used to the seats. However, that’s not always the case but you do have options to help with this – you can try a gel seat cover and/or padded bike shorts. And it they don’t work it is easy to replace the seat as it fits standard fitting bike seats – so you can get one that is more to your liking. Handlebars. The handlebars are covered which helps to give a better grip. There are elbow pads included which provide more comfort making it possible to lean on them for longer periods without the arms starting to ache and hurt. The angle of the handlebars can be changed by loosening the knob at the front just below the console. This can help you get the most comfortable position for leaning on and bring the ends closer or further way for a better reach according to your preference. This can help accommodate people of different heights. Noise. The bike operates very quietly with at most a soft whirring sound being heard. You don’t have to turn the TV up to heart it clearly. Others in the room may even forget you are exercising. The loudest noise is likely to be loud breathing as the result of exerting yourself. You can workout when you want even at night when others are sleeping and you probably won’t wake them. It makes it good for use in an apartment as your neighbor won’t have any idea you are exercising – and if you live on an upper floor apartment a rubber exercise mat will make doubly sure. Cleaning. The bike does need some cleaning down to help prevent damage from sweat. Sweat is very corrosive and even with the bike having protective coatings it will damage the bike over time. Wiping it down after use will help to keep the bike working better for longer and looking better too. If you put the bike on a rubber exercise mat that will also prevent the floor from being damaged by sweat. It has a footprint of 21.6 by 41.8 ins. It won’t overwhelm most rooms and can easily be stored in a corner or against a wall if you don’t have room or don’t want to leave it out as a reminder to use it. There 2 transport wheels at the front of the bike that make it easy to move around. You tip the bike on to them which is easy to do and then one person can wheel the bike. They work well on most surfaces except very soft surface and deep pile carpet where they may jam up and you’ll need to slide the bike. The bike weighs 68.6 lb so you probably want two people at least when lifting and moving it up and downstairs. If you have a wood floor it is a good idea to be caution as you may find the wheels scratch or dent the floor. There is a requirement to complete the assembly of the bike. It comes with the drive and frame together which is the hardest part done. It takes most people about 1 to 2 hours to finish the assembly. Some can do it much quicker. The tools needed for the job are included and they adequate but if you have your own you’ll probably find it goes much quicker. One person can do it on their own but it easier with two as it can be awkward holding a piece while it is attached to bike in particular when attaching the console and its wires. The instructions and diagrams are pretty clear and the pieces go together properly with holes lining as they should. If you have ever put IKEA furniture together you will find this easier. It involves putting on the stabilizer bars, pedals, seat post, seat, front post, handlebars, console and water bottle holder. However, if you still feel unsure about doing this, it is possible to have the bike assembled for you in your home by using the Amazon service which has positive feedback from people who have used it. It does cost extra but it does give peace of mind and saves you time and hassle. The bike comes with a console that has a lot of very good features including dual display, a range of workout measures, pre-set programs, speakers, fan and charger. At the top of th4 console is where you plug in your device to use the speaker and next to it is the USB port for downloading workout results and charging devices. Below these are the two displays with the media shelf in between them. If you place a tablet on shelf it covers up the top display but you can still the lower one. At the side of the lower display are the up/down buttons used to adjust the resistance levels on level at a time. Below this is the keypad where you can modify and select the programs to use. On both sides of this area are a set of 5 buttons (10 in total) that allow you to do a quick jump to resistance levels marked on the buttons. In between these buttons are where you can set up and select programs. There is a goal track button for displaying workout totals and achievements for selected user. Next is a quick start button for when you just want to get on the bike and pedal and choose and change your resistance as you go. In the center of the area are direction keys and an okay button for moving through set up menus and program selection. Above this are LED lights that come on when you achieve a target – they let you know if it is in the current workout, or its the longest workout, a calorie record, in the last workout, last 7 days or in the last 30 days. The console also make a celebratory sound when you achieve a target – this can give you a boost of motivation when you need it even if it sounds a little twee. Over to the right of this central area is the button for choosing the user, a button for entering the programs menus and a button for pausing or ending current workouts. At the bottom of the panel are the left and right speakers and between them is the fan. Both display screens are backlit so can be seen in all light conditions. The measures are large enough to be seen from your seat. The screens are a bit out of date in terms of presentation but they are clear so you can see and understand how you are progressing – whether you are on track or off track depending on what you are trying to get from the bike. The upper display is the larger of the two measuring 5 by 3 ins. This has more of a graphical display of your progress. At the top it lets you know which program you are following. To the left of the screen is column with a 1 to 10 scale giving an indication of the intensity of your workout. On the right hand side is another column that works the same way but monitors your heart rate it fills in as your heart rate increases to let you know your heart rate zone. It has a scale as percentage of your heart rate training. It has less than 50% – warm up zone, 50 – 70 % – fat burn, Aerobic 70 – 80 %, 80 – 90% anaerobic and 100%. In between is where it displays the resistance and time segments for the workout program you are following. This is graphical where the screen is split up into columns with each column a time segment and the length of the column indicating the amount of resistance for that segment. To let you know where you are up to the column flashes. At the bottom it lets you know the user, goal type you’ve selected (calories, time or distance), how much of the goal there is left to go, the percentage of goal completed and a star that comes on when a goal or milestone is achieved. The lower display is smaller at 5 by 1 ins. It is a simpler and just has measures displayed which can customized for each user. Left channel can show speed, time or distance. The middle channel can display distance, resistance or RPM. The right channel shows calories or heart rate if hand pulse sensors held or heart rate strap worn. You can change what is displayed here in your user profile. Manual. This is the program where you select the user, then push the quick start button and off you go. It starts off with resistance level 4 but you can change this as you go. Profile Programs. These 12 programs are split into time segments with changes in resistance from segment to segment. The resistance is changed automatically by the bike as you move through the program. You can change the resistance level if it’s not right for you by using the resistance buttons on the console to set it at a better level for you. The programs are split into 3 categories – fun, mountains and challenges – which do give you some idea of what to expect. There are images of each of the programs in the online manual to give you an idea of what to expect. You can set a goal of either time, distance or calories for the program you select. The time segment changes as you change the length of the workout rather than increasing the number of segments – so you may find them longer than you’d like as you extend it to 60 minutes or more. For a 30 minute workout and the intervals are 2 minutes long. Heart Rate Control Programs. To use these programs you do need to be monitoring your heart either by gripping the hand pulse sensors or by wearing a heart rate strap. These work by trying to keep your heart rate in training zone based on your maximum heart rate for your age. You have the choice of beginner or advanced. Within these choices you can then select – 50 – 60%, 60 – 70%, 70 – 80% or 80 – 90% depending on your workout goal. You can set a target for time, distance or calories. The hand pulse sensors are at the bottom of the handlebars. Both of them need to be gripped at the same time to get a reading which does restrict you when wanting to monitor your heart rate or you are using one of the heart rate control programs. Customers have said that they’ve got accurate readings from them. If you need to get off the bike it is possible to pause a workout but this only lasts for five minutes before the bike goes into sleep mode – you then have to start again from scratch. But, these type sensors can be unreliable with some people not being able to get a proper or any reading at all from them. This isn’t an issue just for this bike but is common to all bikes who have these type of sensors. If this reading is important to you then it is worth checking if the sensors work for you because they come with the bike. If they don’t or you just want a better reading, then you can buy a non-coded Polar heart rate strap and that will work with the bike which provides a more reliable reading. After your workouts (except the quick start) the bike goes into a cool down program for 3 minutes where it sets resistance at a 1/3rd of your average of your workout program which you can change. It displays the results of your workout during this time. Fitness Test Program – to use this program you do need to be monitoring your heart rate. It is a way of testing your fitness progress. It compares watt (power output) to your heart rate. You choose beginner or advanced and then the resistance is slowly increased until you reach 75% of your maximum heart rate. It then holds the intensity steady for 3 minutes. At the end of it you get a fitness score that you can compare over time determine how you are getting on. Recovery Program. This a test you can do after your workout that gives you an indication of how quickly you recover from workouts. You have to monitoring your heart rate for this. It lasts a minute. It takes your heart rate at the end of the minute away from your heart rate at the beginning of the minute – the bigger the difference the quicker you’re heart rate is returning to a resting state. You can set up profiles for 4 different users. This allows you to have better measures for calories and heart rate zones and also for tracking your performance separately particularly on the App or account or on a spreadsheet if you prefer. When setting up your profile – you enter name. gender, age, height, weight and you can also set up the measure you want displayed on the lower screen. If someone who has not been set up as a user their workout and measures will be added to the last user profile. There isn’t a guest profile but if there isn’t 4 of you using the bike regularly you could use one of the profiles for that. The bike is plugged into the house supply for power (no batteries required). It plugs into the bike at the front at the bottom of the bike. It does lead you to have the bike facing the wall so you probably need an extension cord to place the bike where you want. Also if there is no power the console doesn’t work nor is there any resistance. The console does beep and if that annoys you can turn it off in the set up mode which is good when using at night and in a bedroom like some people do. The instructions for using the console don’t come in the manual you get with the bike this needs to be downloaded from their site. When standing on the pedals some people find that the console is closer than they’d like which can make it feel a little uncomfortable and harder to see your measures or media device. You can have distance and speed displayed in metric or imperial – it is miles by default. Water bottle holder. This one isn’t part of the console. It is on the front support about halfway down. It is in easy reach with only a little leaning needed to get to your bottle. Media Shelf. This just below the upper display and will fit MP3 players, tablets. kindles etc easily. They shouldn’t fall out as the bike is steady. It can provide some distraction while you exercise which can make it go faster and if you really don’t like exercise make it a little less painful and maybe something you look forward to. If you are shorter you may struggle to see your device screen clearly due to the tilt of the console. Unfortunately this can’t be changed. Fan. The 3 way speed blows a cooling breeze on your face – it’s not that strong even at the highest speed but it helps a little to prevent you getting too hot. Speakers. You use these by plugging your device into the console using the included media cable. They don’t get very loud but you can hear them easily and the quality is passable so you can give up the headphones. The program selection and volume is controlled by your device not the console. USB Port. This can be used to charge your devices and for downloading your workout if you don’t want to use bluetooth. It is a slow charge so with tablets and the like it will prevent them from draining rather than charge them up for you. Fitness App/Bluetooth Using bluetooth you can sync the machine with the Nautilus Connect App where you can then upload your information to their fitness account and myfitnesspal.com. It doesn’t work with the machine at present to control and monitor as you workout. It’s good for monitoring and tracking performance over a period of time. The App and account are fairly basic without much information and the interface with myfitnesspal.com isn’t always reliable and you maybe better typing it in yourself. You may find if you are wanting to watch TV you have to angle the bike slightly so that your view is not blocked by the console. The bike has good reviews customers with 87% rating it a 4 or 5 indicates the majority are happy with their purchase. However, there are a handful that aren’t and this comes down to service and delivery issues. Both do seem rare. The delivery is a risk for all bikes but it does seem to be getting better overall for all bikes including this one. It does seem Nautilus has let themselves down in a couple of instances by not responding to issues as quickly as they should but there are customers who are delighted with their response to problems (again very few have had an issue). As expected with a bike seat there are a number of people who find it very uncomfortable. But others find it comfortable. This happens with all bike seats. It is possible to replace it or cover it with a gel seat cover. People describe the quality as very good – some say it is as good as the quality of bikes they’ve used at the gym. They find it operates very quietly, easy to assemble and to use – they like the programs and that they can just get on with their workouts without any issues. For about an extra $150 than the Nautilus U614 (when I checked) you get a better constructed bike with 3 piece cranks, more workout programs, easier upload to your fitness accounts, better adjustment to fit the bike to you and more resistance levels. It’s going to stand up to rigorous training (although not apparent in customer reviews) and provide you with more option. The Nautilus U616 Upright Bike comes with a lot of great features to get a good low impact cardio workout in your home. It can be used by beginners and more advanced users. The resistance can be adjusted to the level you want and there are a range of pre-set programs that can cater for different levels of fitness to provide challenge and guidance as well as variety to your workouts to help them achieve their fitness goals. You can stand on the pedals for more intense workouts and leverage but if you are an experienced cyclist or indoor cycler or similar you are likely to find the resistance soft. It also is a little awkward with it not having the same design as a spin bike that has a better layout and tougher resistance settings. This upright exercise bike provides you with a good range of options to help you reach your fitness goals whether you’re a beginner or an intermediate (and above). It is solid, it is quiet and compact making it a good option to get your exercise done in your home rather than out in the bad weather or having to go to the gym.